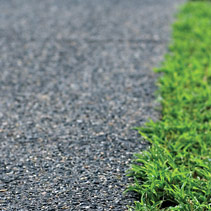 Exposed aggregate concrete finishes are a visually appealing alternative to an asphalt driveway or concrete path. The ‘exposed’ surface reveals the natural textures of the aggregate mix which could include pebbles, shells, silicate or crushed Quarry stone, each creating a unique and distinctive appearance. 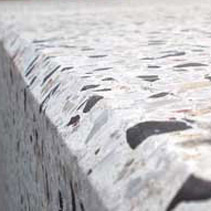 Exposed aggregate concrete achieves smooth, clean lines and is extremely low-maintenance, long-lasting and attractive. 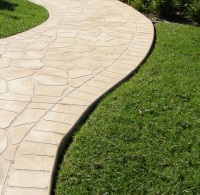 With the ability to have panels of colour, timber or rock inserted to create geometric patterns, this is an attractive choice for driveways, paths or stairs. SJC Industries use the Boral Exposé® aggregate range available in a variety of aggregate mixes and colour combinations with options suitable for both traditional style homes, contemporary homes or commercial applications. If you are after a soft feel under foot, then smooth river stones would be your choice. If your steep driveway is in need of traction, rough and angular quarry stones would suit. In commercial environments, colourful Boral Exposé® driveways, stairs and paths can highlight your business entrances, define your car parks and border your gardens. To add extra dimension and individualise your area, select any of the colours from the Boral Colori® range and add them to your favourite Boral Exposé® product. Consider using Boral Luminesque® exposed concrete aggregate, a unique decorative concrete that ‘glows in the dark’ by radiating natural light at night. Download the Boral Exposé® product document to view available aggregate options. Luminesque® is a patented new concrete aggregate application producing a bright natural glow in the dark, illuminating polished concrete floors, garden pathways, outdoor areas and driveways. Available in a range of colours, this new aggregate technology radiates lights for hours after daylight sun exposure. Stencilled or stamped decorative concrete has a huge range of applications and styles, and are an attractive and affordable option to finish your driveway or path. Stencilling combines the unbeatable durability of concrete with the distinctive appeal of traditional brick, cobblestone pavers, tiles or mosaics. Using standard stencils or stamps, attractive concrete patterns resembling slate, tiles, pavers, brickwork, stone or random paving, can be created. Perfect for outdoor areas such as your driveway or pathway, this finish is easy to install, cost effective and very durable. Our stencilling work incorporates superior performance and durability to withstand the harsh Australian conditions. 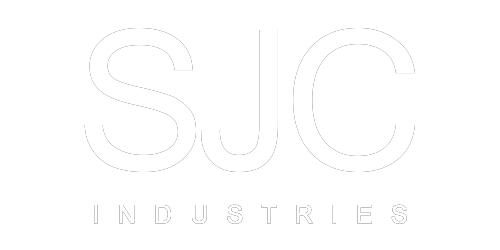 SJC Industries use quality Parchem concrete stencils. Please view the available patterns here. Use the Parchem Concrete Design Visualiser to help choose your stencil pattern available here. Download the Parchem Stencil product document to view available stencil options. Coloured concrete is a very popular decorative option providing a stylish outdoor alternative to regular concrete driveways, paths or stairs. SJC Industries use Boral Colori® coloured concrete which utilises Colourset™ technology exclusive to Boral, meaning their coloured concrete contains a colour enhancer to provide brighter, more durable colours. Boral’s bright, durable range of Colori® coloured concrete reflects the true colours of nature. Concrete is coloured with the addition of a pigment into the concrete mix or sprinkled on top of the concrete as it sets. Download the Boral Colori® product document to view colour options available. 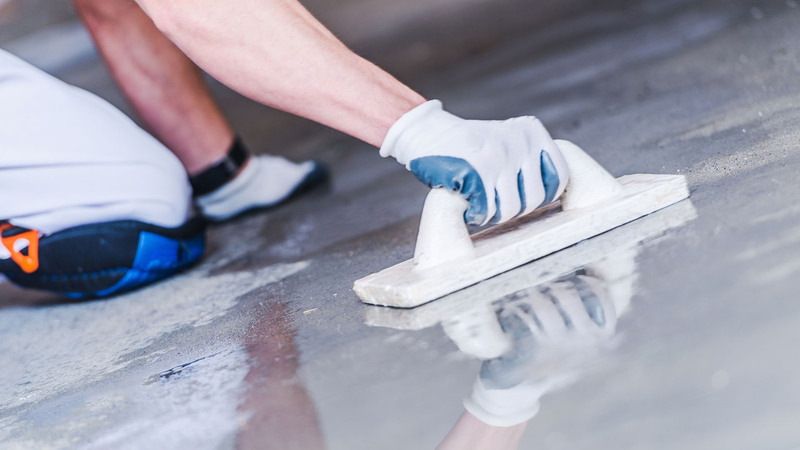 Polished concrete is an affordable, energy efficient, low-maintenance alternative particularly when laid as part of a structural concrete slab or driveway. 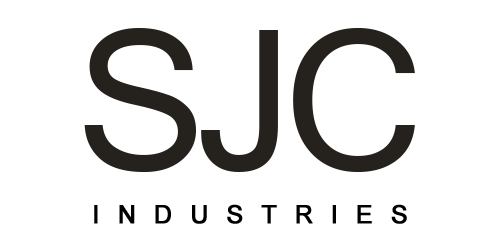 SJC Industries use Boral’s Boralstone® which is shaped and then polished to a smooth surface, course cut for a rougher finish or hammered to give a pitted effect. Special aggregates are usually chosen to give a polished stone appearance. 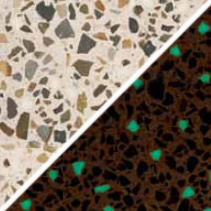 Aggregate colours, types (round or crushed), sizes, or mineral-content, can be selected and blended to produce a variety of finishes including polished granite-type (reconstituted stone) finishes. Hard aggregates such as quartz and igneous rocks are preferred as they polish well and provide an excellent wearing surface. Boralstone® polished concrete combines the strength of concrete with the beauty of polished stone. Select from a wide range of concrete colours and stone combinations for a custom finish for concrete driveways, paths or stairs. The SJC Industries team of fully licensed professional concreter’s in Springfield, Ipswich, Ripley, Gatton and Toowoomba, can help you with any size concrete shed slab, whether it is a small garden shed or large commercial slab. 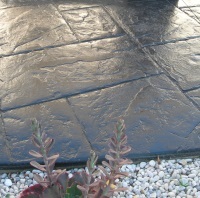 We can advise you on the depth and type of slab required depending upon the soil and rock conditions of your property. We will organise all aspects of your shed slab including excavation, fill removal and site levelling through to the framework and reinforcing, pouring, concrete pumping and concrete finishing. Also consider polished concrete or coloured concrete as an alternative, both of which are an affordable, energy efficient, low-maintenance flooring alternative particularly when laid as part of a structural concrete slab.